John M. McHugh, the 21st Secretary of the Army, is an alumnus of Syracuse University. You should know his story because it’s a Syracuse University story—one that speaks to our past, our present, and our future. McHugh is a native Central New Yorker—born in Watertown in 1948 and a graduate of Watertown High School. After high school, McHugh attended Utica College, a satellite campus of Syracuse University at the time, and received a Bachelor of Arts in Political Science in 1970. He later attended the Nelson A. Rockefeller Graduate School of Public Affairs at the State University of New York at Albany, where he received a Master of Public Administration in 1977. McHugh started out working in city government in Watertown, but quickly engaged himself in political service after graduate school as an aide to State Senator H. Douglas Barclay from 1977 to 1984. After Barclay stepped down from the New York State Senate in 1984, McHugh won Barclay’s seat and represented the 46th NYS Senate district. After eight successful years in the state senate, McHugh decided to run for New York’s 24th Congressional District in 1993, ultimately winning the predominately conservative district. McHugh served for nine terms as representative for the 24th (now 23rd) congressional district from 1993 to 2009. As ranking Republican on the House Armed Services Committee, McHugh fought vigorously to protect Fort Drum from budget cuts, support major acquisition projects, and attract new military-related jobs to the district. He served on the House Committee on International Relations and Committee on Oversight and Government Reform; he also chaired the Subcommittee on the Postal Service. In addition, McHugh co-chaired the House Army Caucus, a bipartisan organization that educates other Representatives and their staffs about Army-related issues and programs. Viewed as a pragmatic, centrist Republican, a 2009 New York Times article stated, “Mr. McHugh … is part of a vanishing breed in the House: centrist Republicans from Northeastern states.” His ability to work across the aisle with Democrats and Republicans garnered great respect from top party members on both sides, including President Barack Obama. 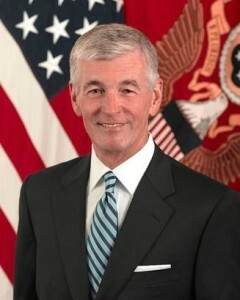 Most notably, President Obama nominated McHugh in 2009 to succeed Pete Geren as the Secretary of the Army. As Secretary, McHugh is responsible for the U.S. Army’s annual budget of over $200 billion, the health and welfare of more than 1.1 million active duty, Army National Guard, and Army Reserve soldiers, and nearly half a million civilian employees and contractors. John M. McHugh is an alumnus of Syracuse University and the Secretary of the Army. You should know his story.